Iberian lynx is the most endangered feline in the world. This species has recently been classified as "critically threatened" by IUCN, recognizing that its extinction will be imminent if urgent measures of conservation are not adopted. At a rough estimate there are less than 200 individuals distributed in two isolated populations. The lynx populations have been undergoing a generalized reduction in the last decades, mainly associated to the decrease of the threatened population of wild rabbits, which are their main prey, and also the scarce recovery of them in the present habitat of the felines. Due to the high scarcity of prey levels, in 2002 we began a supplemental feeding programme from Doñana biological station aiming to maintain and preserve the lynx habitats inside the national park, by introducing new rabbits to the enclosure. Moreover, we will try to establish young and dispersed Iberian lynx in the areas where the prey availability is not a limiting factor. We are evaluating the effect of using this technique as a measure of the management and conservation of the wild lynx population. The ecological consequences are measured for different levels: Individual, subpopulation and population. We are determining changes in hunting behaviour, parameters for the population such as productivity, survival, spatial use, interactions between individuals and changes in the dispersal behaviour. For the progress of the research work, we are using GPS-GSM collars from TELEVILT on the Iberian Lynx, to facilitate evaluation of the effects from the supplemental feeding programme. 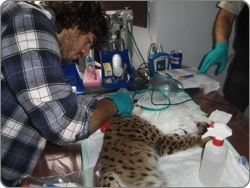 On February 14th 2007, two Tellus GPS-GSM collars were deployed on young Iberian lynx in the main subpopulation inside the Doñana National Park. These animals are the first Iberian lynx in the world using GPS-GSM collars.